Opana is a potent opioid narcotic prescription drug. This drug may have gained popularity with people using these medications to get “high,” or for nonmedical purposes, when OxyContin was reformulated in 2010, making it more difficult to crush and snort or inject the drug, Reuters reports. The Drug Enforcement Administration, or DEA, classifies oxymorphone, the generic form of the brand name Opana, as a Schedule II controlled substance due to its high potential for diversion, abuse, and dependency potential. Prescribed to control pain, Opana comes in both an extended- (Opana ER) or immediate-release format. It is sometimes referred to by slang names, such as stop signs, O bomb, blue heaven, octagons, pink lady, new blues, and Mrs. O. Opana, like other opioids, increases pleasure, relaxation, and relieves pain and stress by slowing down some of the functions of the central nervous system, such as respiration, blood pressure, and heart rate, and increasing the presence of some of the chemical messengers that signal happiness. Opioid drugs like oxymorphone, when taken regularly, can cause a tolerance to form, leading an individual to take more of the drug to keep feeling its effects. This is true for both recreational and legitimate medicinal users. Someone taking Opana to control pain may need to take a higher dose just as someone who abuses it for the euphoric and mellow feeling may. Physical dependence can occur in anyone taking Opana for an extended period of time, whether legitimately or not. Drug dependence is when the brain is used to the interaction of the drug in the body and on its chemical messengers. Neurotransmitters like dopamine are increased by the presence of Opana in the bloodstream, which circumvents the brain’s natural reward pathways. The chemistry and circuitry in the brain is actually altered with regular use or abuse of an opioid drug. A new pathway, or shortcut, to reward and pleasure is created. Without Opana, individuals who are dependent on it may not be able to feel pleasure as easily and may experience opioid withdrawal. The makers of Opana and Opana ER, Endo Pharmaceuticals, states that Opana use should not be stopped suddenly as withdrawal symptoms may follow tolerance and drug dependence. In the case of Opana, medical detox is optimal, as it can help to minimize and control symptoms of withdrawal, often with the use of medicals or pharmaceutical tools. Dependence on Opana may be both physical and psychological, as may the withdrawal side effects that often start when the drug leaves the bloodstream. The journal Practical Pain Management states that oxymorphone has a half-life of 7-9 hours, which is longer than a shorter-acting drug like oxycodone (OxyContin). Withdrawal typically begins after the drug stops being effective, usually after it is mostly eliminated from the bloodstream. In the case of Opana then, withdrawal may likely start within 14-18 hours after the last dose. More than 12,000 people sought emergency department treatment for a negative reaction to the nonmedical use of oxymorphone in 2011, per the DEA. Withdrawal from an opioid like Opana can be both physically and emotionally strenuous; therefore, it is not recommended to stop taking the drug “cold turkey.” Instead, professional help offered through medical detox can minimize and help to reduce the intensity and duration of these potential side effects. Opioid withdrawal may progress through two distinct phases: early and late withdrawal. It generally peaks in a day or two, lasting between 5-7 days on average. Early withdrawal symptoms begin first. They may include anxiety, restless, insomnia, and milder flu-like symptoms. Late opioid withdrawal likely starts after a few days of stopping the drug and includes nausea, goosebumps, and more intense flu-like symptoms as well as potential drug cravings. Withdrawal and detox will not be the same for everyone, however, as there are several factors that may influence a person’s level of dependence to Opana. Therefore, the severity and length of detox and withdrawal may vary greatly. Someone with a family or personal history of addiction or substance abuse may be more likely to become more heavily dependent on Opana, for example, as may someone who abused the drug through snorting, smoking, or injecting it. Crushing Opana bypasses the extended-release format, sending the entire dose of the drug into the bloodstream at once. This not only increases the risk for a potentially life-threatening overdose, but can also increase a person’s level of dependency more rapidly. A person taking a lot of Opana for a long time is probably more dependent on it than someone who has been taking lower doses for less time. Personal biology and genetics may also play a role in why some people become addicted more quickly than others. Certain medical or mental health conditions may factor in. Environmental factors, such as family support, childhood trauma, and stress, may also influence an individual’s substance abuse patterns and affect the level of dependency on the drug as well. Medical detox is often considered the optimal form of detox to ease withdrawal from an opioid drug like Opana. Provided in a specialized facility with professionals to monitor a person’s vital signs and mental health around the clock, medical detox also uses medications to smooth out and reduce withdrawal side effects. There are typically two types of medications used during opioid detox: substitution medications and adjunct medications. Opioid substitution medications are other opioid agonists, like methadone or buprenorphine products, that help to keep withdrawal symptoms at bay by filling the same opioid receptors along the central nervous system that Opana itself did. Both methadone and buprenorphine are considered long-acting opioids, so fewer doses are needed less often to keep these receptors activated. The Substance Abuse and Mental Health Services Administration (SAMHSA) reports that there are four buprenorphine products approved by the FDA: Suboxone, Bunavail, Zubsolv, and buprenorphine transmucosal products like Subutex. The first three of these products contain not only buprenorphine, but also naloxone, which is an opioid antagonist. This part of the drug usually remains dormant unless there are attempts to abuse the drug, and if that happens, naloxone can precipitate withdrawal. For this reason, buprenorphine combination products may be used later on in treatment or after Opana is completely removed from the bloodstream during detox. Adjunct medications include any form of medication that can manage specific Opana withdrawal symptoms. For example, an anti-nausea medication may help with gastrointestinal symptoms, while a sleep aid may combat insomnia and restlessness. Antidepressants and anti-anxiety medications can be helpful during Opana withdrawal to assist with the imbalance of neurotransmitters in the brain caused by drug dependence and abuse. 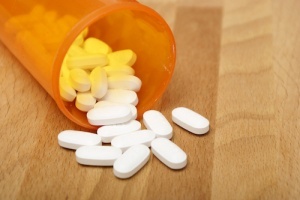 Medications that are generally used for other purposes may be used off-label to treat opioid withdrawal. For instance, clonidine (Catapres) is a blood pressure medicine that the journal Practical Pain Management postulates may be regularly used to treat opioid withdrawal symptoms, as it can lessen many of the negative symptoms associated with opioid withdrawal.